Keep a section of your pond ice free with the Farm Innovators Heated Pond Saucer. 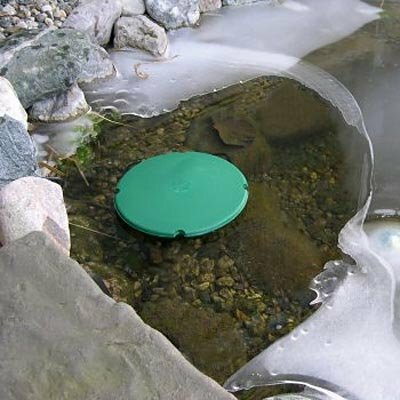 This flat item floats on the top of your pond and maintains a small hole in the ice around it. The unit is thermostatically controlled to operate only when the temperature drops below freezing. The flat shape of the item is often unnoticed in ponds, and its low profile minimizes wind resistance. The unit will work in ponds up to 1,000 gallons, and uses only 200 Watts to operate. The green color adds a touch of spring to the winter surroundings, and the plastic construction will last for several seasons. Help your pond stay healthy through the winter with the Heated Pond Saucer. One year limited warranty. If you have any questions about this product by Farm Innovators, contact us by completing and submitting the form below. If you are looking for a specif part number, please include it with your message.